Objective To identify the source (press releases or news) of distortions, exaggerations, or changes to the main conclusions drawn from research that could potentially influence a reader’s health related behaviour. Design Retrospective quantitative content analysis. Setting Journal articles, press releases, and related news, with accompanying simulations. Sample Press releases (n=462) on biomedical and health related science issued by 20 leading UK universities in 2011, alongside their associated peer reviewed research papers and news stories (n=668). Main outcome measures Advice to readers to change behaviour, causal statements drawn from correlational research, and inference to humans from animal research that went beyond those in the associated peer reviewed papers. “Information subsidies” such as university press releases have long been used to deliver salient aspects of selected research,12 13 and as journalists are increasingly expected to produce more copy in less time14 15 these press releases have become the dominant link between academia and the media.16 17 As such, information included in press releases is highly likely to be included in news stories.18 Although accurate information, alone, is not sufficient for clear public understanding and informed behaviour,19 it is nevertheless important that health and science news is not misleading, especially when it includes health advice for readers. News pieces have a different purpose to, and readership from, journal articles and are not expected to reproduce them or express claims in the same way. However, given that news is often explicitly or implicitly blamed for distorting and exaggerating scientific findings,9 it is pertinent to determine the sources of such misreporting. In fact there is little evidence on how often news stories go beyond what scientists state in peer reviewed journal articles, and, when they do, whether misrepresentation is already present in the un-peer reviewed sources supplied by scientists and press offices. We aimed to clarify how often news contains claims or advice from health related research that go beyond those in the peer reviewed journal articles, and to identify the likely source of these exaggerations (press releases or news). Furthermore, we tested whether exaggerations in press releases were associated with a higher likelihood of news coverage, compared with press releases without exaggeration. 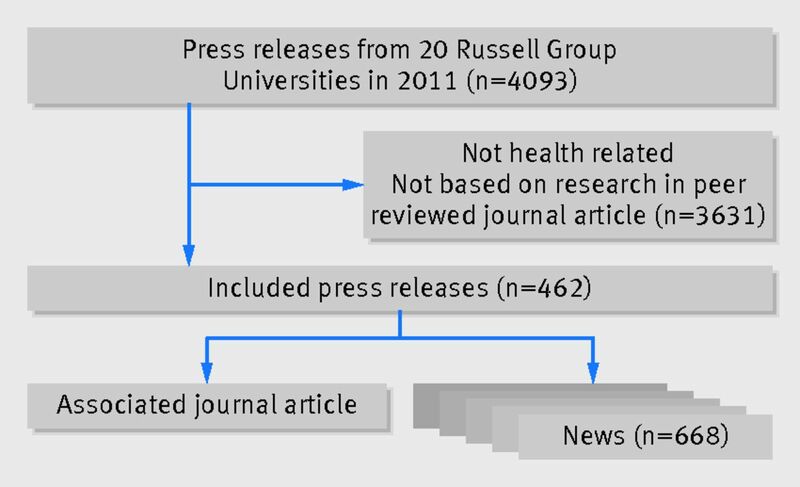 From publicly accessible university repositories we identified all the press releases based on published studies with possible relevance for human health (biomedical and psychological sciences; fig 1⇓) issued in 2011 by the Russell Group universities (the 20 leading UK research universities). We selected these universities as a clearly defined group with international prominence; we did not expect differences between this sample and other UK or international press releases (see for example20 21). For each relevant press release (n=462) we sourced the associated peer reviewed journal article and print or online news stories (n=668) from national press using the Nexis database, BBC, Reuters, and Google (we did not include broadcast news; the number of news stories per press release ranged from 0-10). We coded each journal article, press release, and news set using a detailed protocol available online (http://dx.doi.org/10.6084/m9.figshare.903704; supplementary information SI sections 1-3 provide full details of our sample and methods). Each set took on average 3-4 hours to code. We double coded 27% of press releases and journal articles and 21% of news stories (concordance rate 91%, mean κ=0.88; given the large number our simulations show that 10% disagreement would not influence our conclusions, see supplementary section SI7). Taking the peer reviewed paper as a baseline (which is not to assume that peer reviewed publications are true; many already contain exaggeration), we sought cases where news stories offered advice to readers, made causal claims, or inferred relevance to humans beyond (or different to) that stated in the associated peer reviewed paper. Given the likelihood that some statements in journal articles themselves would be considered exaggerated by other scientists in the specialty, our overall levels of measured exaggeration are likely to be underestimates. We then asked whether such discrepancies were already present in the corresponding press release. For example, if a study reported a correlation between stress and wine consumption and the news story claimed that wine causes stress, what did the press release say? Similarly, if a news story claimed a new treatment for humans but the study was on rodents, what did the press release say? We coded each journal article, press release, and news story for the maximum level of advice it contained using four levels based on explicitness and directness: no advice, implicit advice (for example, “these findings suggest that mid-late childhood may be the best bet for childhood obesity prevention”, “simply exercising with a best friend or having a friend who is a good exercise role model increases the chance of a child keeping fit and active”), explicit advice, but not to the reader or general public (for example, “I think we now have enough evidence to say that pulse oximetry screening should be incorporated into everyday clinical practice”, “ambulatory monitoring is recommended for most patients before the start of hypertensive drugs”), and explicit advice to the reader or general public (for example, “children who are thirsty should be encouraged to drink water”, “for anyone considering taking aspirin I would recommend . . .”). Relevant samples for analysis of exaggeration of advice were those containing at least one implicit or explicit advice statement anywhere in the journal article or press release or news (n=213 press releases, n=116 press releases with news; n=360 news stories). For journal articles, press releases, and related news stories associated with correlational results we coded for the strength of the main statements of the findings. For press releases and news we used the title and first two sentences as their main statements, since nearly all follow the “inverted pyramid” structure of stating their main claims first.25 For journal articles we used the abstract and discussion. We used a seven point scale to rate increasing levels of determinism, where the presence of stronger statements trumped weaker ones: no statement (in which case no further comparison was possible), explicit statement of no relation, correlational (for example, “drinking wine is associated with increased cancer rates”), ambiguous (for example, “drinking wine linked to cancer risk”), conditional causal (for example, “drinking wine might increase cancer risk”), can cause (for example, “drinking wine can increase cancer risk”), and unconditionally causal (for example, “drinking wine increases cancer risk”). For analysis of causal claims we focused on correlational research, which we defined as observational cross sectional and longitudinal designs. We did not analyse qualitative, interventional, or simulation designs. We coded the first claim statement for our primary analysis (relevant samples for analysis were 182 press release, 95 with news; 261 news stories). Where a second statement occurred about a different variable pair, we also coded these for replication (see supplementary section SI5 for analysis). 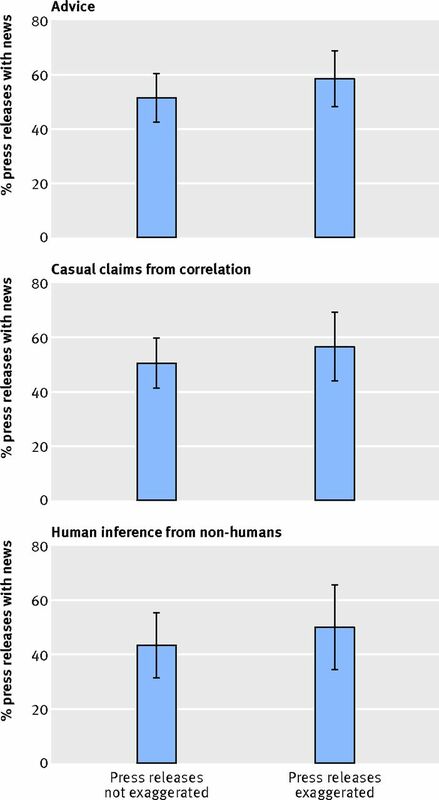 For each non-human study (animals, cells, or simulations), we coded whether the main statements of press release and news were phrased as explicitly non-human, implicitly human (for example, “a pregnant mother’s stress level affects the brain of her unborn baby”), or explicitly human (for example, “a pregnant woman’s stress . . .”). For journal articles we searched the discussion section and abstract for any statements about human relevance. Relevant samples for analysis were 105 press releases, 48 with news; 115 news stories. We searched the whole press release and news stories for any caveats stated for the advice, causal claims, or inference to humans (for example, “This is a population study. It cannot say definitively that sugary drinks raise your blood pressure, but it’s one piece of the evidence in a jigsaw puzzle”, “The scientists who carried out the study emphasized that they could not say for certain . . .”). Similarly, we searched for justifications of the advice, claims, or inference (for example, “even after taking into account the effect of extra body weight on blood pressure, there was still a significant link with sweetened drinks”). We also coded facts about the study and press release, including sample size, duration, completion rate, and the source of quotes. These are analysed in section SI11 of the supplementary file. Further details of the coding methodology are given in section SI2 of the supplementary file. All coding sheets (n=462), full instructions for coding, and data analysis files and programs are available online (http://dx.doi.org/10.6084/m9.figshare.903704). We used generalised estimating equations to calculate percentages and 95% confidence intervals for news with exaggeration relative to what was present in the journal article, while adjusting for the clustering of several news articles to one press release (using an exchangeable working correlation). The generalised estimating equations framework was also employed to estimate the association (in odds ratios) between exaggeration in the press release and exaggeration in the news. Note that these analyses included only those journal articles and press releases for which there was at least one news story (and the news could be appropriately coded for the relevant analysis). We compare the characteristics of press releases with and without associated news, using bootstrapped 95% confidence intervals and standard inferential statistical tests. For our analysis of advice we found that 40% of the press releases contained more direct or explicit advice than did the journal article (bootstrapped 95% confidence interval 33% to 46%). For our analysis of statements based on correlational results (cross sectional or longitudinal) we found that 33% of primary claims in press releases were more strongly deterministic than those present in the associated journal article (bootstrapped 95% confidence interval 26% to 40%). For studies on animals, cells, or simulations, 36% of press releases exhibited inflated inference to humans compared with the journal article (bootstrapped 95% confidence interval 28% to 46%). Given the likelihood that some statements in journal articles themselves would be considered exaggerated by other scientists in the specialty, our levels of measured exaggeration are likely to be underestimates. Figure 2⇓ summarises the rates of exaggeration in news for press releases that did or did not already contain exaggeration. For advice, overall 36% of news (95% confidence interval 29% to 44%) contained more direct or explicit advice than did the journal article. The odds of exaggerated advice in news was 6.5 times higher (odds ratio 6.5, 95% confidence interval 3.5 to 12.4) when the press release contained exaggerated advice (58%, 95% confidence interval 48% to 68%; see table⇓ for the odds) than when it did not (17%, 10% to 24%; difference 41%, 95% confidence interval 28% to 53%). For main news statements about correlational results, 39% (95% confidence interval 31% to 49%) were more strongly deterministic than those present in the associated journal article. The odds of exaggerated statements in news was 20 times higher (95% confidence interval 7.6 to 51) when press release statements were exaggerated (81%, 95% confidence interval 70% to 93%) than when they were not (18%, 9% to 27%; difference 63%, 95% confidence interval 49% to 78%). 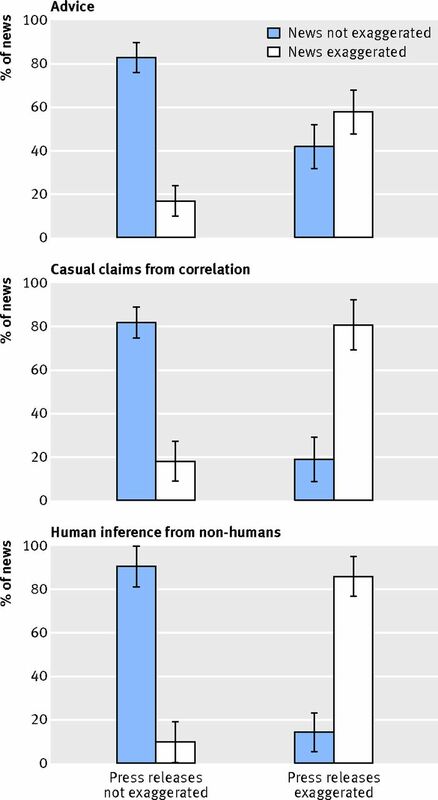 For non-human studies, 47% of news contained inflated inference to humans. The odds of exaggeration in news was 56 times higher (95% confidence interval 15 to 211) when press release statements were exaggerated (86%, 95% confidence interval 77% to 95%) than when they were not (9.6%, 0% to 19%; difference 76%, 95% confidence interval 63% to 89%). See supplementary section SI5-7 for further details of these results. A key motivation for inflating advice, causal inference, or inference to humans in press releases may be the assumption that it greatly increases news uptake. Contrary to our expectations, however, the proportion of press releases with at least one associated news story did not differ significantly between press releases with exaggeration and those without for any of our three analyses (figure 3⇓ and table), although in this dataset we cannot assess what the news uptake would have been for identical press releases with and without exaggeration. While there was a small numerical increase in news uptake with exaggerated press releases, any real effect is unlikely to be greater than the upper confidence intervals. For advice, 66/128 (52%) press releases without exaggeration had news uptake compared with 50/85 (59%) press releases with exaggerated advice (bootstrapped 95% confidence intervals of the difference −6.4% to 21%). For causal claims from correlation, 61/122 (50%) press releases without exaggeration had news uptake compared with 34/60 (57%) press releases with exaggerated claims (95% confidence intervals of the difference −9% to 22%; see supplementary SI5 for secondary statements). For inference to humans, 29/67 (43%) press releases without exaggeration had news uptake compared with 19/38 (50%) press releases with exaggerated advice (95% confidence intervals of the difference −13% to 27%). Further, there was no statistical support for the idea that when press releases do successfully generate news, exaggeration would be linked with more associated news stories. As for percentage news uptake, any real effect is unlikely to be greater than the upper confidence intervals. Non-exaggerated advice was associated with 2.8 news stories per press release, whereas exaggerated advice was associated with 3.4 news stories per press release (95% confidence intervals of difference −0.3 to 1.5). Non-exaggerated main causal claims were associated with 2.8 news stories per press release, whereas exaggerated causal claims were associated with 2.7 news stories per press release (95% confidence intervals of difference −1.0 to 1.0). Non-exaggerated inference to humans was associated with 2.3 news stories per press release, whereas exaggerated inference was associated with 2.5 news stories per press release (95% confidence intervals of difference −0.8 to 1.1). Between universities there was also no evidence that higher rates of inflated claims in press releases attracted more news uptake. The percentage of inflated advice, causal statements, or inference to humans in press releases varied from 11% to 50%, while the proportion of press releases with news varied from 8% to 87%, but these did not significantly correlate (r=0.13; see supplementary section SI9). We also tested whether explicit caveats mentioned about advice, causal statements, or inference to humans from animal research in press releases were associated with reduced news uptake, as many scientists and press officers might fear. Overall, caveats were rare in press releases, and there was a clear association between their presence or absence in press releases and in news (see supplementary section SI8). But we found no evidence for an effect on uptake; if anything, caveats to causal statements might be associated with higher uptake (69% v 51%, bootstrapped 95% confidence intervals of difference −0.1% and 35%; note that numbers are small for caveats). We also coded the presence of justifications for advice, causal claims, and inference to humans that would help readers judge which statements are warranted; these were also rare, highly associated between press release and news, but with no evidence for an effect on news uptake (see supplementary section SI10). Although it is common to blame media outlets and their journalists for news perceived as exaggerated, sensationalised, or alarmist, our principle findings were that most of the inflation detected in our study did not occur de novo in the media but was already present in the text of the press releases produced by academics and their establishments. Among biomedical and health related press releases issued by Russell Group universities in 2011, 33% to 40% contained exaggerated statements compared with the corresponding peer reviewed journal articles. Moreover, when press releases contained exaggeration it was likely that the news would too (58% for advice, 81% for causal claims, and 86% for inference to humans, fig 2), but when press releases did not contain exaggeration, rates of exaggeration in news were only 17%, 18%, and 10%, respectively. Therefore the odds of exaggerated news were substantially higher when the press releases issued by the academic institutions were exaggerated (odds ratios 6.5, 20, and 56, respectively). Our study was correlational, so does not demonstrate a causal relation between inflated statements in press releases and inflated news. For example, if journalists did not read the press releases, associated exaggeration could nevertheless emerge between the press release and news because of features in the journal articles that might naturally lead to such exaggerations. However, many sources of converging evidence point to press releases as the main source of science news,17 18 21 26 27 including the quotes and study facts analysed from our data (see supplementary section SI11). Although some of the studies will have had press releases released from both university and journal, this could only increase the proportion of occasions when exaggeration is already contained in at least one important press release source. It is not yet known whether exaggeration rates in press releases issued by journals differ noticeably from those issued by universities; our ongoing research is exploring this further. Changes in presentation style between peer reviewed papers and press releases are expected in order to spark the interest of journalists. But seeking simplification and stimulating interest does not justify exaggeration. Moreover, contrary to common assumption, we did not find evidence that exaggerated statements in press releases are more likely to attract news uptake or substantially increase the number of news articles when they do occur. We also found no indication that caveats in press releases reduce uptake, although presumably the fear that they do is the reason caveats are so rare. These aspects of our results should be clarified by further research. It may not be simply the case that similar press uptake would be achieved with non-exaggerated headlines and inclusion of caveats. For example, press releases with exaggeration may not be based on journal articles with news value equal to those without exaggeration. Similarly, caveats may have been included in our sample of press releases only where likely press interest was already judged to be sufficiently strong. Since we are not experts in every discipline (and experts also disagree), we did not attempt to code whether changes to advice, causal claims, and inference to humans from animal research were scientifically justified. It is possible that some journal articles are worded over-cautiously, and in these cases stronger or more direct statements in press releases might be justifiable (although our results showed that they are rarely explicitly justified in press releases, see supplementary section SI10). However, we assume that pressure to publish means that most journal articles already contain the highest level (at least) of justifiable inference and advice; if further inflation occurs in a press release, it is thus likely to go beyond what a consensus of scientific opinion would find acceptable. Consistent with this interpretation, a preliminary survey (see supplementary section SI12 and figure S2) revealed that a surprising number of scientists were willing to say that their press releases were exaggerated (relative to their own judgment of what was scientifically justified). Furthermore, given the imperfections of peer review, many journal articles may contain statements that are already exaggerated relative to a consensus of scientific opinion, or at least spun to emphasise positive findings,22 and thus our measured level of within university exaggeration is likely to underestimate the extent of the problem. It is important that these results are not perceived as simply shifting the blame from one group of non-scientists (journalists) to another (press officers). Most press releases issued by universities are drafted in dialogue between scientists and press officers and are not released without the approval of scientists20 (and confirmed in our survey, see supplementary section SI12), and thus most of the responsibility for exaggeration must lie with the scientific authors. At the other end of the chain, journalists have a continuing responsibility to cross check their sources even if their working conditions make that increasingly difficult. The blame—if it can be meaningfully apportioned—lies mainly with the increasing culture of university competition and self promotion, interacting with the increasing pressures on journalists to do more with less time. It is interesting in this context that news outlets were broadly similar in the degree of exaggeration between press release and news (see supplementary section SI13). Our findings may seem like bad news but we prefer to view them positively: if the majority of exaggeration occurs within academic establishments, then the academic community has the opportunity to make an important difference to the quality of biomedical and health related news. Arguably it would be far more difficult to change the working practices and cultures of journalists at independent news organisations. Furthermore, we are not arguing that accurate (or appropriately cautious) claims are sufficient for the public readership to make well informed choices in health related issues (that is, the discredited information deficit model).19 The potential influence of the media on the opinion and behaviour of different publics is complex and other factors are involved.1 5 6 What we do argue is that appropriate claims are a necessary starting point, that misleading claims can do harm, and that since many such claims originate within universities, the scientific community has the ability to improve this situation. We thank our professional advisory group for input into this research, including Rob Dawson (BBSRC), Fiona Fox (Science Media Centre), Ruth Francis (Biomed Central), James Gallagher (BBC), Helen Jamison (Science Media Centre), Alok Jha (The Guardian), Emma Little (The Sun), Carmel Turner (Medical Research Council), Bob Ward (Grantham Institute), and Ed Yong (National Geographic); Ananyo Bhattacharya and Simon Dymond for helpful discussions; and Eleanor-Rose Corney and Caitlin Argument for research assistance. Contributors: PS, CDC, AW, JB, and FB conceived and planned the research. SV-G, AD, JO, LW, BH, and BD carried out the research, supervised by PS and CDC and funded by grants awarded to PS and CDC. SV-G, PS, CDC, CAV, and JB analysed and presented the data. PS, CDC, JB, and AW wrote the paper. PS, CDC, JB, and CAV revised the paper. PS and CDC contributed equally to this work and are the guarantors. Funding: This study was supported by grants from the British Psychological Society, Experimental Psychology Society, Wales Institute of Cognitive Neuroscience, the Wellcome Trust, the Economic and Social Research Council, the Biotechnology and Biological Sciences Research Council, and Cardiff University. Competing interests: All authors have completed the ICMJE uniform disclosure form at www.icmje.org/coi_disclosure.pdf (available on request from the corresponding author) and declare that: the study was supported by grants from the British Psychological Society, Experimental Psychology Society, Wales Institute of Cognitive Neuroscience, the Wellcome Trust, the Economic and Social Research Council, and the Biotechnology and Biological Sciences Research Council, and Cardiff University; no financial relationships with any organisations, except universities, that might have an interest in the submitted work in the previous three years; their spouses, partners, or children have no financial relationships that may be relevant to the submitted work; no other relationships or activities that could appear to have influenced the submitted work. Data sharing: All coding sheets (n=462), full instructions for coding, summary data files, and analysis programs are available online (http://dx.doi.org/10.6084/m9.figshare.903704). Transparency: The lead authors (PS and CDC) affirm that the manuscript is an honest, accurate, and transparent account of the study being reported; that no important aspects of the study have been omitted; and that any discrepancies from the study as planned have been explained. Lewis J. Constructing Public Opinion. Open University Press, 2001. Grilli R, Ramsay C, Minozzi S. Mass media interventions: effects on health services utilisation. Cochrane Database Syst Rev2002;1:CD000389. Phillips DP, Kanter EJ, Bednarczyk B, Tastad PL. Importance of the lay press in the transmission of medical knowledge to the scientific community. N Engl J Med1991;325:1180-3. Sharma V, Dowd MD, Swanson DS, Slaughter AJ, Simon SD. Influence of the news media on diagnostic testing in the emergency department. Arch Pediatr Adolesc Med2003;157:257-60. Boyce T. Health, risk and news: the MMR vaccine and the media. Peter Lang, 2007. Kitzinger J. Framing abuse. Pluto Press, 2004. Ramsay ME. Measles: the legacy of low vaccine coverage. Arch Dis Childhood2013;98:752-4. Schwitzer G. How do US journalists cover treatments, tests, products, and procedures? An evaluation of 500 stories. PLoS Med2008;5:e95. Cooper BEJ, Lee WE, Goldacre BM, Sanders TA. The quality of the evidence for dietary advice given in UK national newspapers. Public Underst Sci2012;21:664-73. Leveson B. An inquiry into the culture, practices and ethics of the press. Stationery Office, 2012: pp22, 80, 690-1, 1803. ISBN 9780102981100. Gandy OH. Beyond agenda setting. Ablex Publishing, 1982. Nelkin D. Selling science. W H Freeman, 1995. Lewis J, Williams A, Franklin B. A compromised fourth estate? Journal Stud2008;9:1-20. Bauer MW, Bucchi M. Journalism, science, and society. Routledge, 2008. Kiernan V. Embargoed science. University of Illinois Press, 2006. Williams A, Clifford S. Mapping the field: specialist science news journalism in the UK national media. Science and the Media Expert Group, Department of Business, Innovation and Skills. 2009. Schwartz LM, Woloshin S, Andrews A. Influence of medical journal press releases on the quality of associated newspaper coverage: retrospective cohort study. BMJ2012;344:d8164. Sturgis P, Allum N. science in society: re-evaluating the deficit model of public attitudes. Public Underst Sci2004;13:55-74. Woloshin S, Schwartz LM, Casella SL. Press releases by academic medical centers: not so academic? Ann Intern Med2009;150:613-8. Brechman J, Lee CJ, Cappella JN. Lost in translation? : a comparison of cancer-genetics reporting in the press release and its subsequent coverage in the press. Sci Commun2009;30:453-74. Yavchitz A, Boutron I, Bafeta A, Marroun I, Charles P, Mantz J, et al. Misrepresentation of randomized controlled trials in press releases and news coverage: a cohort study. PLoS Med2012;9:e1001308. Science Media Centre. 10-best-practice-guidelines-for-science-and-health-reporting. 2012. www.sciencemediacentre.org. Van der Worp HB, Howells DW, Sena ES, Porritt MJ, Rewell S, O’Collins V, et al. Can animal models of disease reliably inform human studies? PLoS Med2010;7:e1000245. Pottker H. News and its communicative quality: the inverted pyramid—when and why did it appear? Journal Stud2003;4:501-11. Bartlett C, Sterne, J, Egger, M.. What is newsworthy? Longitudinal study of the reporting of medical research in two British newspapers. BMJ 2002;325:81. De Semir V. Press releases of science journal articles and subsequent newspaper stories on the same topic. JAMA1998;280:294-5.